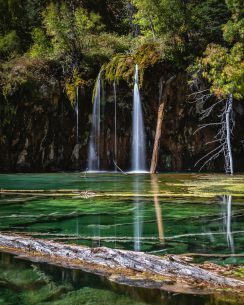 Hanging Lake is located on a fault line and was formed when roughly an acre and a half of the valley floor sheared off from the fault and dropped to what is now the shallow bed of the lake. The turquoise colors of the lake are produced by carbonate minerals that have dissolved in the water. For this shot, I actually had to super-crop, recompose, and isolate this frame 😅.